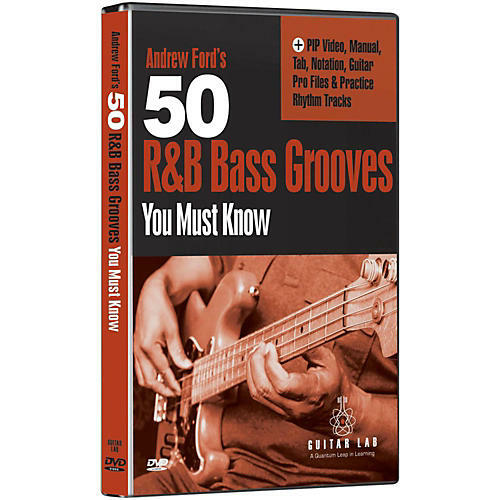 50 R&B Bass Grooves You Must Know, Andrew Ford generously shares essential bass lines and grooves inspired by the music of James Brown, Sly and the Family Stone, Marvin Gaye, The Brothers Johnson, Chic, Bill Withers, Curtis Mayfield, Stevie Wonder, Jackson 5 and many other chart-topping artists. Hosted by Andrew Ford, who has performed with legendary artists in almost every major genre of music, while also having a Masters degree in Education. If it gets your feet tapping, your head nodding and your body swaying, then the music you're listening to is genetically tied to the renaissance of groove that was sparked back in the 60's and 70's with R&B, Soul and Funk music. If you're familiar with that music then you can clearly recognize its influence on virtually every style of popular music today, from rock to jazz to hip hop to contemporary R&B. Make no mistake about it; while Andrew does examine these timeless grooves, this is no history course. Andrew presents the material and connects the dots in such a way that you'll be able to apply the underlying techniques, rhythms and bass grooves in whatever style of music you play today. Consider these 50 bass lessons as your personal rite of passage to the land of groove.